The Watercooler - Casual Fridays: For when you've got too much work to do but need to drop in! Casual Fridays: For when you've got too much work to do but need to drop in! I realised that on Fridays in my office, things can get busy and it's difficult to have time to feed my NA boards addiction. So here's a thread for all of us who haven't got the time to enter into ongoing debates on Pam's red sweater or Jim's rolled up sleeves, but need to say something. Anything. In a meeting in my boss's office at this very moment. I love notebooks and wireless networks. They think I'm updating the spec. They think I'm updating the spec. I work in an open plan office where no one actually seems to care what I surf. So yay...so long as there's not too much work to distract me. I'm working from home, which is to say I worked from home for the last half hour. Now I'm here. I have work to do, and those files are open on my computer. Waiting for me. Waiting and judging. It's like having a second office really...a nicer one, with better lighting, more heating and more interesting coworkers. Or an office and a workspace. Although I'm not sure which is which. Oh a workspace definitely. I cannot create in the same space that I conduct business. Not that there's much business going on here. I'm here but the combination of not having anything to say and having lots to do in the real world equals not much from me this morning. And it is pantless Fridays, so maybe everyone else is busy googling. Meaning, of course, that they are frantically using google.com to find some good deals on pants. I don't google so much anymore, since I'm only on the computer at work and rarely at home. Our office hadn't done the casual dress Friday thing for a long time, but just implemented last Friday. It's really not that big a deal. Well, to some people it is. Every day is casual Friday at my office. I actually make an effort to try and look smart. Does your boss think he looks good in jeans? What you're trying to say is that you are too bashful to shop online at work. And that's okay. That's how it should be. Shopping online should be an intimate at-home experience. A shopping extravaganza, if you like. We do not do causal fridays in my office. Some other offices here allow for it, but my boss isn't keen on that. He works on a different floor, which being marginally more smart and him being Quite an Important Person, means he wears trousers. I am currently wearing a FNB shirt with a ribbon round it and jeans and boots. And that is smart in my office. To give you an idea. It's casual Friday here, so I'm wearing a cute teal fitted shirt, one of those kinds that is kinda low cut at the top to show something, but not everything...I mean, not everything, guys. I promise. I'm not that kind of girl. I'm wearing a black shirt under that to cover up. I'm also wearing jeans and my black Chucks... definitely can't forget the Chucks. It's causal Friday at my school. I'm wearing jeans and an old red Columbia button down shirt that I've had for more than 8 years. How do I know this? It's the first article clothing that Mrs. Daoust ever bought me after we started dating. Some people might think it's a bit weird to have a shirt for 8 years. Others have closets full of such things. By the way all of my clothing choices are pretty conservative, because I like to leave everything to the imagination. I think Chucks are nun-chucks, MLD. lemonade has her puple belt in karate. Either that or Chucks refer to an article of clothing from Chuck Norris' womens clothing line. I hear his Spring line is to die for. Some people might think it's a bit weird to have a shirt for 8 years. I once had a pair of trainers for 10 years. And I have a tshirt which is 9 years old now. And it is pantless Fridays, so maybe everyone else is busy googling. If we ever downsize, your job is totally safe. 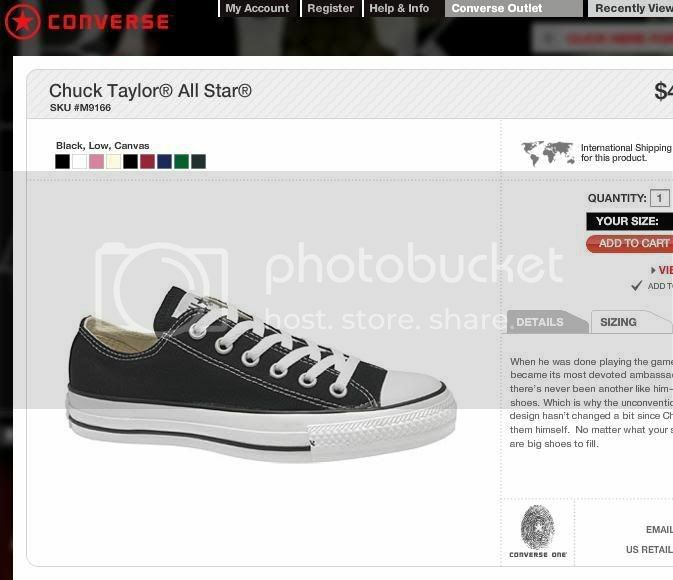 Chucks = Chuck Taylors, basketball sneakers. Have you started the paperwork yet? Call James, we''ll fight this just like the old days. Also, fire griefbone. I am so much better than him. Ah! Living in ignorance in England, sorry! I am wearing my Doc Martens boots, although they're not black and shiny like the old skool ones, they're tan and leather and awesome. ETA: Duh, I should have refreshed the page before I posted. That's what I get for going off to write an email before I hit post. I am sitting at my desk in one of my white turtlenecks, black slacks and white tennis shoes. I'm sure this is more casual than my boss would like, however, I am passive-aggressively getting back at my super passive-aggressive boss by lowering the standard of dress in the office. If she has a problem with it, she has to get aggressive-aggressive, which would make her look like less than the lovely graceful patient woman she tries to project to everyone who doesn't directly report to her. I'm sure I'll pay for it some other way. Right now, my feet are very comfortable. lemoñadé I just checked the link that anque posted to some Chucks. They are super cool. You rock.